As I was writing at the previous post. Last summer I got an invitation to participate in a conference at Marseillan a town at South France. The conference was about "tourisme durable" and was organized by the Department of Herault (http://www.cg34.fr). When I got there on the 21th of September I find quite a lot of pleasant surpices! One of them was that I got two new friends, Bertrand and Jan Claude Mason, son and father both working on accessibility to beaches! and further more Bertrand is a wheelchair user and an architect! Too much to be true but it is real! 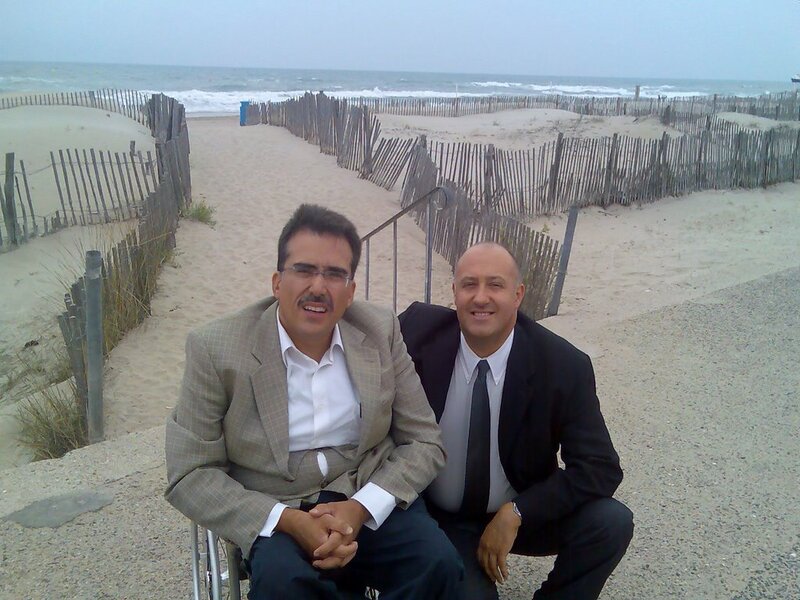 The other thing that I found out is that I am not alone now on this on getting disabled citizens to the beaches. In France there is a whole organization run by disables potential swimmers and tourists! Please go to http://www.handiplage.fr and find out the wonderful work that there are doing! 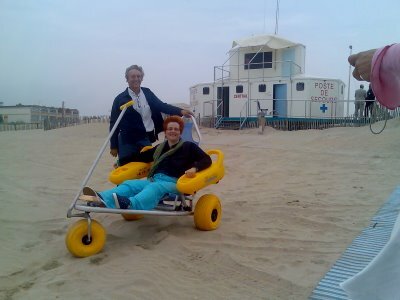 During the conference there was an exhibition taking place where products and services that are beeing used to make a beach accessible were demonstrated. As you can see in this picture the idea of accessibility to the beaches is stuck into my mind! 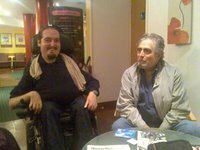 Here I am at the exhibition with Mr. Robert Guiglion (left) the director of the tiralo http://www.tiralo.org Mr. Patrick Baillet of the Mobi -mat accessible corridors (up right) http://www.mobi-mat.com. Mrs Anna Koukoudea civil engineer and her cousin Sissi Klapanara are the other two greeks attending this conference. 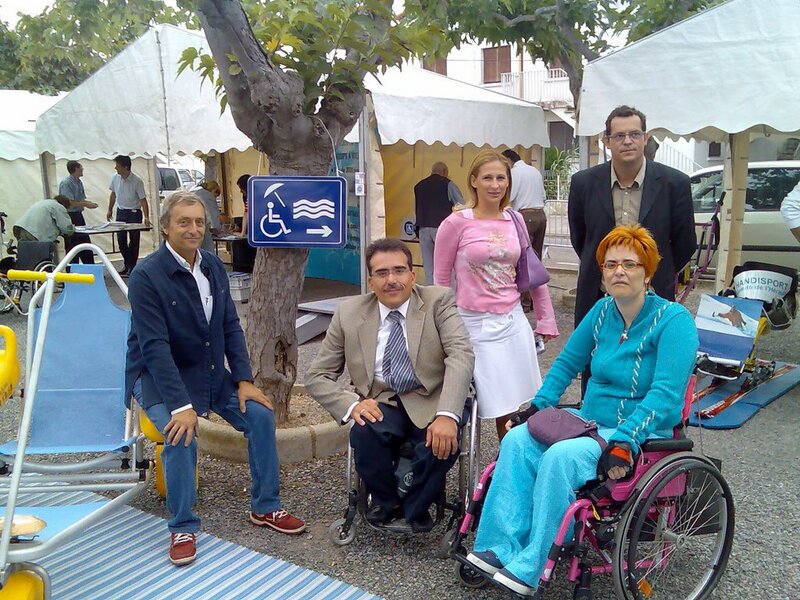 Here I am with the Mayor of Marseillan at the accessible beach. The weather is hot but windy! Anna is tesing tiralo and she seems satisfied! I have just come back from Marseillan a Plage, a lovely town at the South of France, nearby Montpellier where a conferance about "Tourisme Durable" took place. Information about lovely people and a lot of information about accessible beaches are going to posted right here.... Keep reading this site... You will be not disappointed!